When you login to manage your TwineSocial account, you’ll now see a new Analytics tab in the left navigation. Choose your campaign and period to get quick stats on the number of campaign views, engagements, volume of content acquired, popular actions, popular data sources and more. 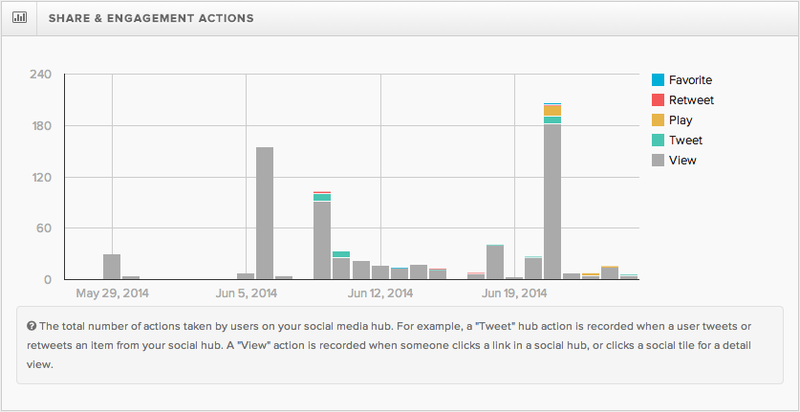 Content Analytics reports let you analyze the content ingested by TwineSocial into your campaigns. This is an easy place to determine where your target content most frequently originates. In addition, if you embed your TwineSocial campaigns on more than one media property, you’ll be able to see which property drives the most volume. Visitor Analytics help you understand your visitor profile and your traffic sources. You’ll quickly determine what your top referring domains and URLs are, the browser type and platform of your users, and geo-coded traffic patterns.